Meal Notes: I tend to hold my breath when turning a cake pan upside-down. So much can and often does go wrong in this moment with otherwise perfectly good cakes. But I breathe a little easier when making this particular cake recipe. I’ve never seen this pineapple-side-down cake fail to come out in-tact and picture-perfect! It’s also reliably fluffy, moist, and plate-scrapingly delicious. Prep: Preheat oven to 350 degrees F. Open and drain can of crushed pineapple, reserving the juice in a small bowl. Place butter in a 9 inch round pan and melt in the oven, taking care to remove before the butter burns. 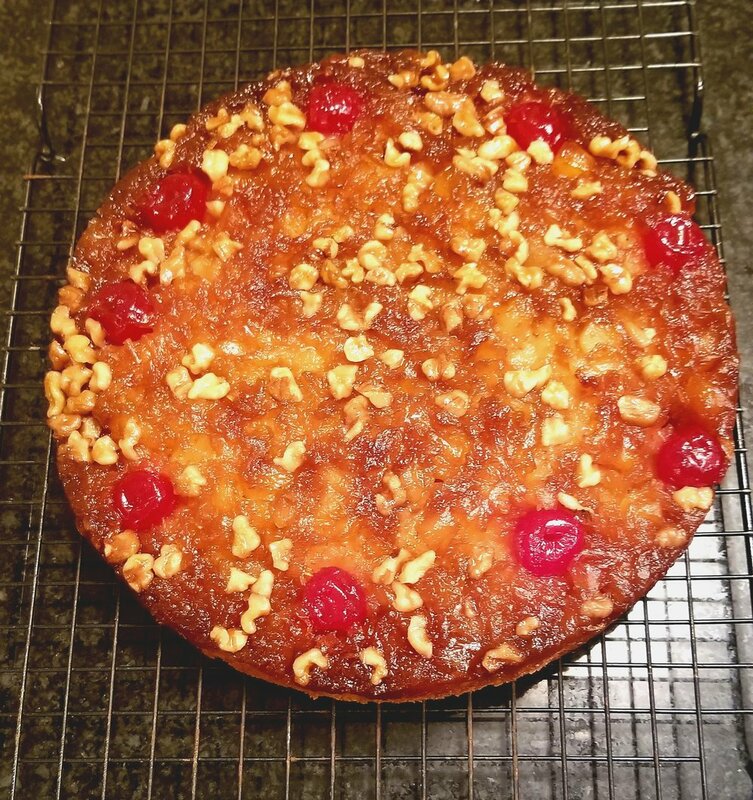 Arrange top of cake: In the round pan of melted butter, arrange cherries according to how many servings you want. Sprinkle with chopped walnuts, brown sugar, and finally the crushed pineapple. Make batter: Using an electric mixer, cream together the shortening and granulated sugar until light and fluffy. Add egg and vanilla. Beat well. Sift together flour, baking powder, and salt. Add flour mixture alternately with the reserved pineapple syrup, beating after each addition. Spread batter evenly over pineapple. Bake cake: Bake for 45-50 minutes. Remove when a toothpick inserted into the center comes out clean. Let stand for five minutes in pan before inverting onto a cooling rack. (Alternately, invert onto a plate and serve warm.